A major line-up of power racers and water sports champions are set to take part in the Sharjah World Championship Week 2018 opening today (December 11) along the Emirate’s Khalid Lagoon. The events are being held under the patronage of Sheikh Sultan bin Mohammed bin Sultan Al Qasimi, Crown Prince and Deputy Ruler of Sharjah. Sharjah Commerce and Tourism Development Authority (SCTDA), in partnership with Sharjah International Marine Sports Club announced the details of the event during a press conference at Hilton Sharjah yesterday (December 10). Two championship water sports competitions form part of the Grand Prix of Sharjah, which include the U.I.M. 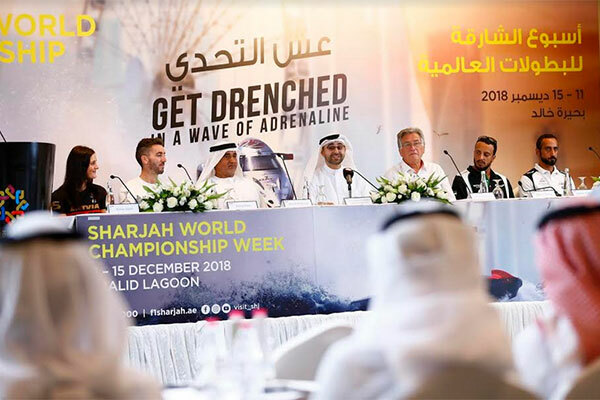 F1H2O World Championship 2018 and the UIM-ABP Aquabike Class Pro Circuit World Championship and will be the main highlights of the Sharjah World Championship Week 2018. The competitions will simultaneously take place from December 11 to 15. Up to 10 Formula 1 Powerboat Racers and 60 Aquabike racers from over 32 countries excel in showcasing their strengths navigating the tunnel-hull catamarans over the water. The sleek yet powerful lightweight catamarans speed across Sharjah’s shoreline leaving its audience amazed by the display.